Medical workers aid injured people at the 2013 Boston Marathon following an explosion in Boston, Monday, April 15, 2013. Two explosions shattered the euphoria of the Boston Marathon finish line on Monday, sending authorities out on the course to carry off the injured while the stragglers were rerouted away from the smoking site of the blasts. 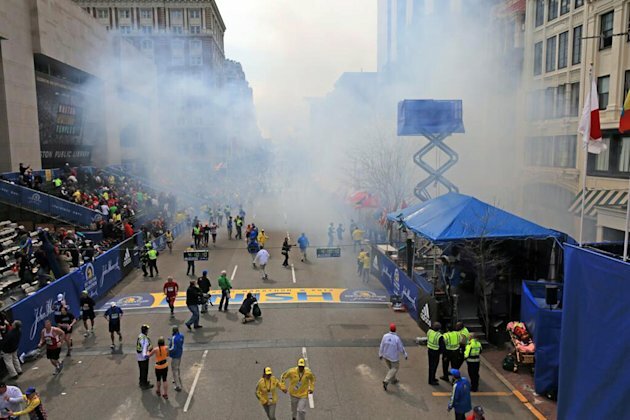 WASHINGTON (AP) — The Federal Aviation Administrationcreated a no-fly zone over the site of two explosions at the annualBoston marathon on Monday, and briefly ordered flights bound for Boston’s Logan International Airport held on the ground at airports around the country. Security for outbound international flights at Logan has been stepped up in the wake of the bombings, federal law enforcement officials said. Numerous runners were expected to leave Boston after race, and the additional security has been added as a precaution, they said. The officials requested anonymity because they weren’t authorized to speak publicly. “While there has been no specific threat made to our transit system at this time, NJ Transit police have deployed both uniformed and plain clothed officers to further patrol our system and keep our customers safe,” the agency said in a statement.